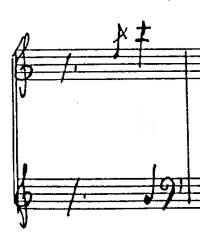 The pause between appearances ranges from four to six eighth notes. There are also a handful of unique changes that happen to the image in this passage, but the above covers the bulk of it. During these twenty or so bars Feldman adjusts the image through these different dimensions, each moving independently of one another. This movement of subtle changes to a single musical image is what creates that feeling of a concentrated train of thought, and we are drawn into this movement, hearing each appearance as a fresh moment. I would not call this way of proceeding “repetition,” although that might be the first word that comes to mind. Calling what Feldman does repetition brings to mind the “classic” minimalist works of Reich, Riley, and Glass, and certainly the “minimalist” label has been applied to late Feldman. But to me there is something quite different about what is happening here. There, repetition of a motive is used to create something larger than that motive: a texture, an ongoing process, a sound mass. Feldman’s focus is completely on the motive or, as I like to call it, the image. He hears it in all its uniqueness and beauty and finds it sufficient in itself. As I described above, our attention is fixed on each fresh appearance of the image rather than on some larger texture or process that’s being built up from these appearances. I also would not call this kind of continuity “development,” at least not in the sense that we usually think of that term, as demonstrated in the works of late Romantic composers. Development is a process by which a theme or motive is made into something else, or some hidden inner nature is revealed through the modifications of its various dimensions (contour, pitch, rhythm, etc.). As with theme-and-variations, the theme might be clothed in different hues and moods. But with Feldman, there is no sense of taking the image anywhere else: there’s nowhere for it to go. Feldman keeps bringing us back to the present moment, the image right in front of us. The image changes, but we don’t feel that as the directed change of development but rather as the subtle shimmering of the image, as if it were viewed in the distance, on the horizon, in the flicker of rising heat waves. Instead, I call this music “reflection”: Feldman is reflecting on the musical image that he has brought into his compositional consciousness. Having arisen, he lets it hang in silence and persist over time. The silence is one of the critical factors that distinguishes Feldman’s music from classic minimalism: without it we would lose the focus on the image in itself and on the moment-to-moment reappearance of the image as it persists in time. The silence articulates the image as a unique moment and gives it the time to echo in our musical consciousness. The image changes as we reflect upon it, but we are not the ones changing it: it is just held in a soft focus and we notice different details from moment to moment. The masterful way in which Feldman subtly changes motives from appearance to appearance is another critical factor for understanding his style. The moments are similar enough for us to feel the concentration on a single image, but different enough to make each moment unique and demanding of our attention. There are many such trains of thought in Palais de mari, and the last half of the piece is almost entirely taken up with reflections on this same grace-note motive. But is there an overall direction to these reflections? An overall shape, structure, or purpose? That’s a good question, and one for another post.